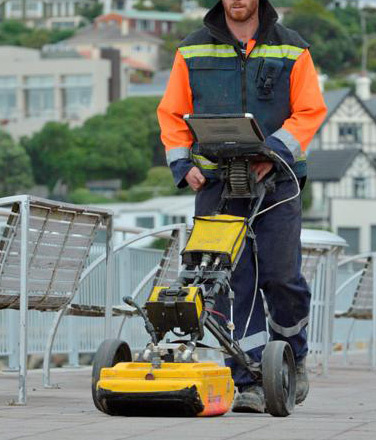 Complete Detection Ltd is here to help you with Ground Penetrating Radars services in Auckland. We have cutting-edge equipment to be able to accurately detect and predict underground images of metallic and non-metallic objects including plastic/gas piping, asbestos, cement, fibre optics cables and many more. electromagnetic energy into the ground and once the energy runs into a buried object or a borderline between materials having dielectric constants, it may be mirrored or diffused back to the surface. The receiving antenna can then document the variations in the return signal. Not only do we use top-notch equipment, Complete Detection Ltd also gives on-going in-house training for all our staff so that we can continue to provide you great services and so we can find a wide range of solutions that work for you. This training involves being updated with internationally accepted underground detection technologies and procedures. and delicate underground services locating jobs. We aim to give you the finest service pertaining to underground service and we will give you just that. Expect supreme date quality and certified reliability. So give us a call or contact us and let us tell you what lies beneath and where. Do not waste your time— the ground is waiting to be detected.